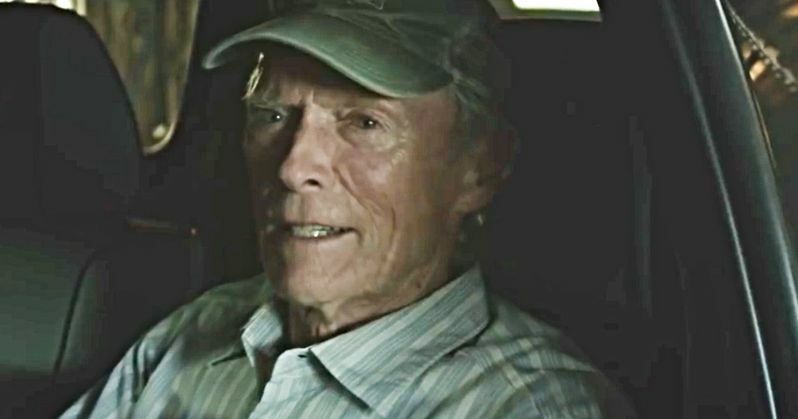 Warner Bros. has released the first trailer for Clint Eastwood's The Mule. This movie is based on a crazy true story about a real-life drug mule who was pushing 90-years-old. Not only is Eastwood putting his skills as a director to use behind the camera for this one, but it marks a return to acting for the Hollywood icon, who hasn't turned in a performance since 2012's Trouble With the Curve and looks like it could easily be his most compelling role in a very long time. This appears to be a match made in heaven, based on this first footage. The trailer kicks off with a tense sequence that gets right to the point, with Clint Eastwood looking at a huge bag of drugs in his pickup truck on the side of the road. A friendly cop asks if he needs any assistance and, unfortunately, his drug dogs, rightly, seem to think something is up. We then cut to a montage of members of the man's family and narration from Eastwood that paints a picture of a man filled with regret, trying to make amends in his twilight years. Things get rather intense before the trailer concludes. The Mule centers on Earl Stone, a man in his 80s who is broke, alone, and facing foreclosure of his business when he is offered a job that simply requires him to drive. However, unbeknownst to him at first, he's just signed on as a drug courier for a Mexican cartel. As something of a blessing and curse, Earl proves to be good at his job and the cartel increases his workload. All the while, Earl has shown up on the radar of hard-nosed DEA agent Colin Bates. And even as his money problems become a thing of the past, Earl's past mistakes start to weigh heavily on him, and it's uncertain if he'll have time to right those wrongs before law enforcement, or the cartel, catches up to him. Aside from Clint Eastwood, this movie has assembled an incredible cast. Bradley Cooper, Laurence Fishburne, Michael Peña, Dianne Wiest, Andy Garcia, Alison Eastwood, Taissa Farmiga, Ignacio Serricchiom, Loren Dean and Eugene Cordero round out the cast. Eastwood previously worked with Cooper on American Sniper, which went on to become a huge success at the box office on its way to a Best Picture Oscar nomination. This looks like it could very well put Eastwood back in the Academy Awards conversation. The filmmaker has been something of a hit/miss with his directorial efforts in recent years, with this year's ambitious The 15:17 to Paris not quite hitting the mark. Yet, his previous effort Sully was a big hit. Either way, this looks like it should be one heck of an experience. The Mule is set to hit theaters on December 14. Be sure to check out the first trailer for the Warner Bros. Pictures YouTube channel for yourself below.